There is more going on under the surface than you imagine. One can be forgiven for thinking that water sports in North Bali-Lovina means going out at 6 am to see the dolphins. 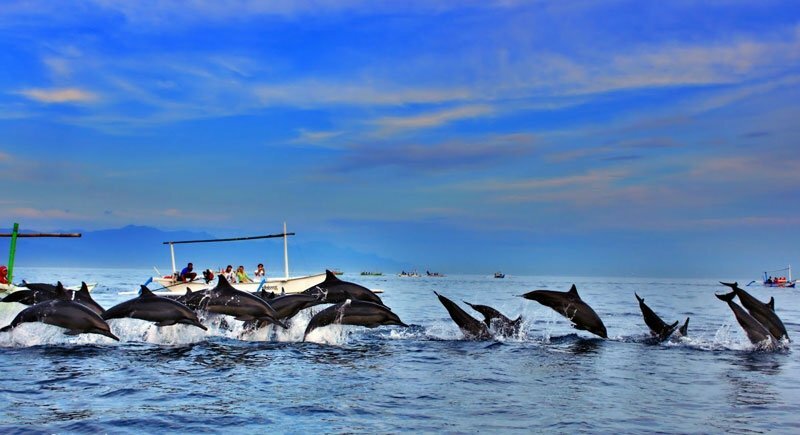 After all, most tourists associate Lovina with dolphin viewing. However, there is much more going on beneath the surface. Lovina does not have the best reefs in Bali but fish life is diverse and abundant. Lovina’s sea is often said to resemble a lake because it is so calm. This means safe snorkelling just off the beach and it is a great place to learn the basics of scuba diving. Lovina is equidistant from Bali’s two finest diving areas –Menjangan Island in the west and Amed in the east. Some professional dive operators in Lovina and environs offer regular dive trips to these areas as well as Lovina’s own reefs. Adirama Resort offers diving off its local reef at the site of an old pier. There is reputed to be an old stone anchor with the letters VOC; not Very Old Coral, but Vereenigde Oostindische Companie (Dutch East Indies Company) whose ships used to moor here at one stage. Here are some of almost a dozen dive companies in the area. Bali Spice Dive was the first PADI Dive Center in Northern Bali (1989). Around 50 employees from equipment handlers to Master Instructors work daily to provide a service exceeding expectations! Spice Dive is the only PADI 5 Star dive-center in Lovina. Properly trained Western and Indonesian dive instructor team have seen more than 10.000 competent student divers trained and certified through Spice Dive. This is the only diving school in Lovina offering enriched air (Nitrox). Lovina Dive Bali: Expert knowledge and fun-loving, friendly staff. You can experience the beauty and wonder of turtles, shark, dolphin and mantas, sights sure to make your Bali diving holiday that much more memorable. 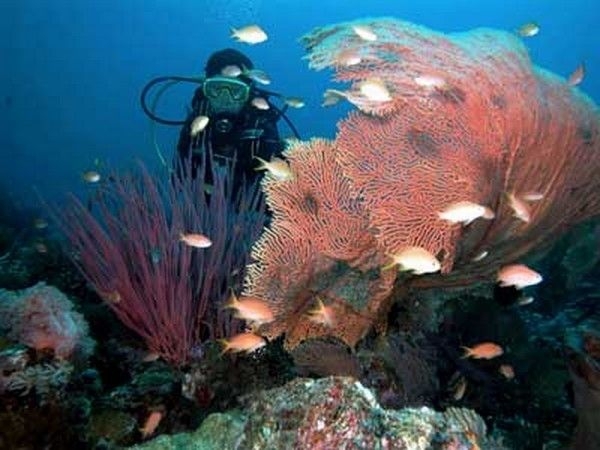 Scuba dive in Tulamben, Puri Jati, Menjangan and other dive sites, combined with a stay in a Lovina hotel. And North Bali Beach Cottages & Spa. A small cozy Resort Destination with Hotel, Dive Center, Diving School, Restaurant, Pool, Spa and Excursion Offers. Small Groups. Many Lovina guesthouses rent out snorkelling equipment for around US$55-US$75 a day and can arrange night time trips out to the reef by boat. Muck diving can be experienced at Puri Jati, Menjangan Island, Pemiteran Reef, Secret Bay, Tulamben Shipwreck, Amed-Jemeluk and Mayo Retreat west of Seririt. The Pemuteran area is unique because no other part of Bali has such large areas of shallow coral reefs, and these are accessible to divers and snorkellers because the region lacks the strong currents and waves that characterize other coastal areas of Bali. However, Pemuteran reefs have suffered greatly from damage by destructive fishing methods due to the low currents. Pemuteran village residents have now taken action to prevent use of these destructive methods in their reefs, whether by locals or outsiders. Over 60 Biorock© coral nursery structures have been installed since June 2000 in the Pemuteran Village Marine Protected Area in cooperation with the Municipality of Pemuteran, Gahawisri (the Balinese Watersports Federation), local dive shops and hotels, and other local stakeholders. With a total length of 300 metres situated in an area of 2 hectares, this is the largest Biorock coral reef nursery and restoration project worldwide, exceeding the combined sizes of all other ongoing projects in the Pacific, Caribbean, and Indian Ocean. Other areas of Indonesia are learning from them. Visit Pemuteran and find out how you can get involved in this coral reconstruction programme. Menjangan Island is part of the National Conservation Park of West Bali. Surrounded by sparkling white sand beaches, stunning coral reefs and fascinating natural beauty. Diving activities are at depths between 20-30 meters. The water is crystal clear and calm with a variety of fish found here. Dive sites of interest include the Anchor Wreck, surrounded by a natural and colorful coral. The best time to visit these underwater wonders around Menjangan is between April and November. Menjangan is named after the wild deer which go swimming in the sea off the island. 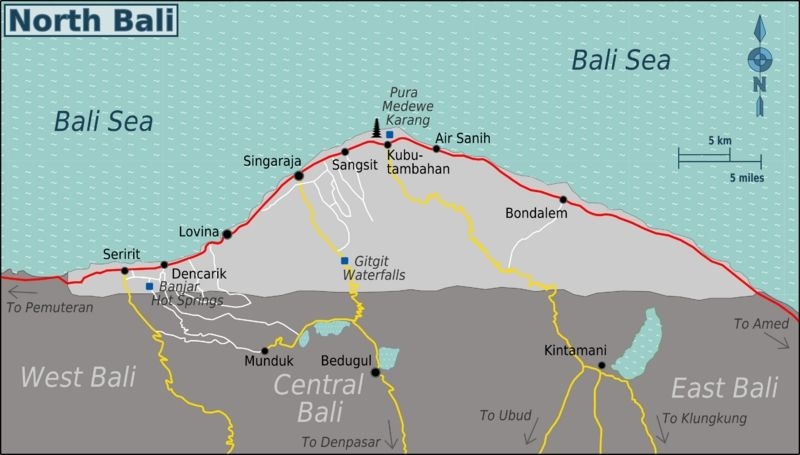 Located about 10 km from the port of Gilimanuk to the west which serves the ferries to and from Java. Activities besides diving and snorkeling: exploring the island temples that are loved by Bali Hindus. Some temples on Menjangan Island: Pura Taman Pingit Klenting Sari, Pesraman Agung Kebo Iwa, Pagoda Agung Dewi Kwan Im, Pendopo Agung Dalem Lingsir Gajah Mada, Puncak Penataran Agung Pingit Klenting Sari, Ida Betara Dalem Lingsir. There is a 5 Star Resort on Menjangan Island and there are more hotels at Pemuteran, with a few more under construction, including the first “tented hotel” in Bali. The next nearest tented resort is the Aman Resort on Moyo Island near Komodo, which also contains wild deer. More diving east of Singaraja: Ask your dive company about the dive on the SS Liberty wreck at Tulamben, or other dives near Amed to see mantas, bump-nosed parrot fish and hundreds of other species. Water Park at Hotel Gran Surya (2* hotel). Their vision is to develop an internationally recognised world-class action and adventure water sporting facility in Lovina, with one of the biggest ocean going inflatable water parks capable of keeping up to 200 adventure seekers actively entertained at a time. However, North Bali Adventure has been urged to tow the floating water park to shore until licenses and permits are sorted. Look out for the colourful floating water park on your next visit. If you love dolphins and would like to get up close with some, then swim with dolphins at Melka Hotel in their large covered sea-water pools. Hotel guests swim free but visitors may also participate for Rp 150.000 each. If you feel like bathing in hot springs in a jungle setting, head up to Banjar Hot Spring, above the Buddhist Temple. Only Rp 15.000 per person. Sailing trips in traditional outriggers. Although you will see a flotilla of yachts off Lovina Beach, unless you know one of the owners you might have to settle for a sail in one of the local “jukungs”. No problems; just saunter along the beach, have a look at the boats on offer and settle on a price for the same day or the next. Of course if you want to get in some arm exercise, you can hire a kayak and head off into the Lovina ”Lake”. Fishing off North Coast. Catch and return or catch and cook. Your hotel concierge will know how to organize a fishing trip in a small outrigger, a larger boat or a much larger boat with all the right equipment for catching "the big one". You can either “catch and return” or keep your catch to brag to the family back at your hotel, as well as share it once the chef has done his wonders on your prize. Adirama Hotel’s chef has a reputation for preparing clients’ “catch of the day”. Now if you don’t have sea legs, you may want to accept to be a passenger in a twin canoe-outrigger on Lake Tamblingan just over the mountain. In this case you should contact one of the wilderness companies in Munduk and go on a trek which includes a visit to the Lake. There might even be some more water involved, like if you choose to visit any of the local waterfalls. Ask about Gitgit, a multi-tiered 40m waterfall between Bedugul and Singaraja. Take time to sit and relax with the sound of the water falling on the boulders. 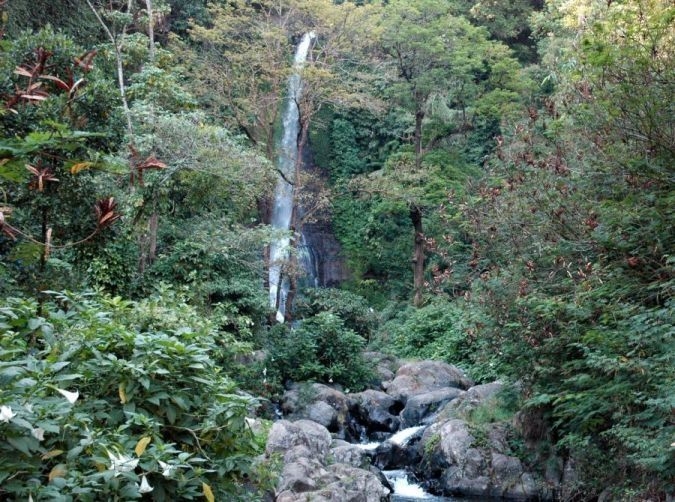 Sing Sing: A smaller waterfall close to Lovina. Sekumpul Waterfall east of Singaraja. Yeh Mempeh: A waterfall up from the coast near Les Village in Tejakula. Canyoning in Gitgit. A French company"Adventure & Spirit" headquartered down at Mas will take you on the rope courses at Gitgit or other canyons. This activity is an ultimate outdoor adventure and sport using a variety of techniques that may include walking, abseiling, jumping, sliding down natural slopes and swimming in white water for aquatic canyons. Another way to discover beautiful and hidden places in the heart of Bali.